The City of Norwood sells its municipal electric light plant and distribution system to The Cincinnati Gas & Electric Company for $200,000. The City grants an electric franchise to the company at that time, also. The Robinson Circus performs twice on this day in Norwood. A non-entertainment highlight was when a 15-year-old run-away boy from Michigan tried to ride an elephant out of the circus grounds. The municipal swimming pool is opened in Victory Park. The Cincinnati, Lebanon and Northern Railroad proposed that an extension of Lafayette Avenue be made from Ashland to Cameron Avenues. This would allow traffic to get to Montgomery Road without having to cross the railroad tracks. This was finally done in 1929 (see below). Future actress and dancer, Vera Ellen Rohe, is born in Norwood. She later takes the stage name Vera-Ellen. The Hagenbeck-Wallac Circus returns to Norwood after missing last year after performing in Norwood since 1914. Howe's Great London Circus & Van Amberg's Trained Wild Animals travels to Norwood for the first time for two performances. Al G. Barnes returns to Norwood again for the first time after the 1919 performances. The Robinson Circus returns to Norwood, probably for the last time. The Ziedman-Pollie Circus performs in Norwood for six days as part of the festivities sponsored by the Leland M. Barnett Post of the American Legion. The almost week-long activities are for fund raising to equip the post's facilitie at 2122 Bennett Avenue. The Al G. Barnes Circus performed as the last circus and maybe as the last outdoor entertainment at the old circus grounds at Smith Road. General Motors buys the land east of Smith Road and south of the B&O RR tracks for new assembly and body plants. This property had been used for years as a baseball park, outdoor theater and circus grounds. The Norwood General Motor's plants start operations. The Chevrolet Division of General Motors Corporation built an assembly plant on Smith Road, near the intersection with Montgomery road. Another G.M.C. unit, The Fisher Body Corporation, opens a body factory next to the Chevrolet plant. Calvin Coolidge becomes the 30th President of the United States when President Warren G. Harding dies by a "stroke of apoplexy" at the Palace Hotel, San Francisco. 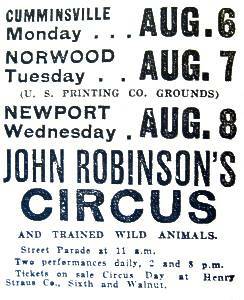 John Robinson's Circus and "trained wild animals" comes to Norwood at the U. S. Printing Co. grounds (the location of today's Dorl Field?). There is a parade at 11 a.m., following by two performances — the first at 2 p.m. and the second at 8 p.m. The circus was in Cumminsville the previous day and Newport the following day, with the same times. Earlier circuses had performed at the lot east of Smith Road, just south of the railroad tracks, but the land was now occupied by the General Motors facility. Norwood begins work on its end of the joint Cincinnati-Norwood Duck Creek sewer project. Cincinnati starts excavations on its part on March 8, 1924. The plan is to encase all of Duck Creek in a 4224 feet long concrete aqueduct. At Smith Road, where the Norwood connection is made, the interior dimensions of the sewer are eight by ten feet. Former creeks that drain into Duck Creek are also converted to lateral sewers. As a part of the project, the bridges over Duck Creek are to be removed and the creek bed filled in, thereby improving Duck Creek Road. WSAI radio is established by the United States Playing Card Company in Norwood. The broadcasts are transmitted from their facilities on Beech Avenue. David Frisch graduates from Norwood High School and takes over operation of the family's business Frisch's Stag Lunch restaurant after the death of his father. Nine years later, he sells his interest to his brothers. In 1938, he opens a new restaurant in Norwood called Frisch's Café, but closes it and his Oakley restaurant because of the Depression. W. S. Cadman, the first superintendent of Norwood Schools, dies. The first Silhouette, Norwood High School's yearbook, is published. The Norwood Presbyterian Church moves to a new building at Floral and Washington Avenues. Norwood plans a celebration for the opening of the Duck Creek sewer. The Commercial Savings Bank of Norwood changes its name to the Norwood Savings Bank (later merged with The First National Bank of Cincinnati) and moves to 4730 Montgomery Road. The Strobridge Lithographing Company having bought the Henderson Lithographing Company of Norwood, moves part of its operation to Norwood. The Frank F. Taylor Company, manufacturer of children's toys ("Taylor Tot") locates in Norwood. The Globe-Wernicke Company is acquired by the Rand Kardex Bureau Company (a newly formed company created by the merger of Rand Kardex and Library Bureau). Globe-Wernicke is to operate as an independent company. Norwood City Council passes an ordinance authorizing a 10-year contract with the Union Gas and Electric Co. for construction and maintenance of traffic lights in Norwood. The Norwood Kiwanis Club holds its first meeting. The organization's charter is approved two days later. The federal government sues Globe-Wernicke and others for violation of the Clayton Act, claiming that a monopoly was being created with the merger of the businesses. The second Masonic Temple in Norwood is dedicated on Hopkins Avenue. 1927 (January) The Federal government's suit against the Globe-Wernicke/Rand Kardex merger is successful as Globe-Wernicke returns to being a separate company. The Dalton Adding Machine Company, including its Norwood plant, is acquired by the Remington-Rand Company (a corporation created that year by the merger of Rand Kardex, Remington Typewriter, and Powers Accounting). Norwood City Council authorizes the Norwood City Planning Commission. Werter G. Betty, co-editor of the book Norwood, Her Homes and Her People, and one of Norwood's first official historians, dies at his home on Madison Avenue, Norwood. Allis-Chalmers Manufacturing Company cancels the charter of The Bullock Electric Manufacturing Company of Ohio. It retained the name "Bullock Works" until 1930. Norwood youngster Lawrence Luebbers (who passed away in Norwood in 2004), pitches a no-hit game for the Norwood Wildcats against the Nixon Cubs in the Boys' Baseball Tournament at Deer Creek Commons. The tournament is sponsored by Cincinnati Community Services. Larry Luebbers, Lawrence's grand-nephew, pitched for the Cincinnati Reds in a few games in the 2002 season. WSAI is sold by the United Stated Playing Card Company of Norwood to the Crosley Radio Corporation. STREET EXTENSION - Lafayette avenue is extended from Ashland to Cameron avenues. Five new voting precincts are added to the city. Norwood National Bank and Hyde Park Bank merge to form the Norwood-Hyde Park Bank. The Ohio state legislature refuses to bring an annexation bill to vote. Governor Cooper displays his support against the bill by saying that he is "for Norwood, separate and inviolable." The effort for home rule by Norwood Mayor Harry Baker, newspaper publisher Dale Wolf and Carl R. Wenzel paid off. The bill, if passed, would have allowed larger cities, such as Cincinnati, to annex smaller municipalities, like Norwood, against their will. Norwood Council passes a resolution to issue $100,000 bonds for the rebuilding of Montgomery Road. At this time, the road is made of granite blocks. The voters approve the bond issue for the reconstrcution of Montgomery Road by 5,341 for and 1,543 against.